It was all on you KD. Congratulations to Kevin Durant and the Golden State Warriors! They are your 2016-17 NBA Champions! Redemption, revenge, and recovery all wrapped in one! Kevin Durant has endured a high level of scrutiny and came out on top. He faced a lot of friction from the media, especially from a few high-level media types right before Game 5. Debate that! If it were not for his injury, I don’t think this Warriors team would’ve had the bench ready to go to war with Cleveland. They didn’t band together until KD went down. Steph didn’t find himself until KD went down. Draymond Green didn’t tap into another level again until KD Went down. Let’s not mention the fact that even I believed Golden State would fall off defensively. They posted league highs in efficiency this year, not only on offense but defense as well. How? 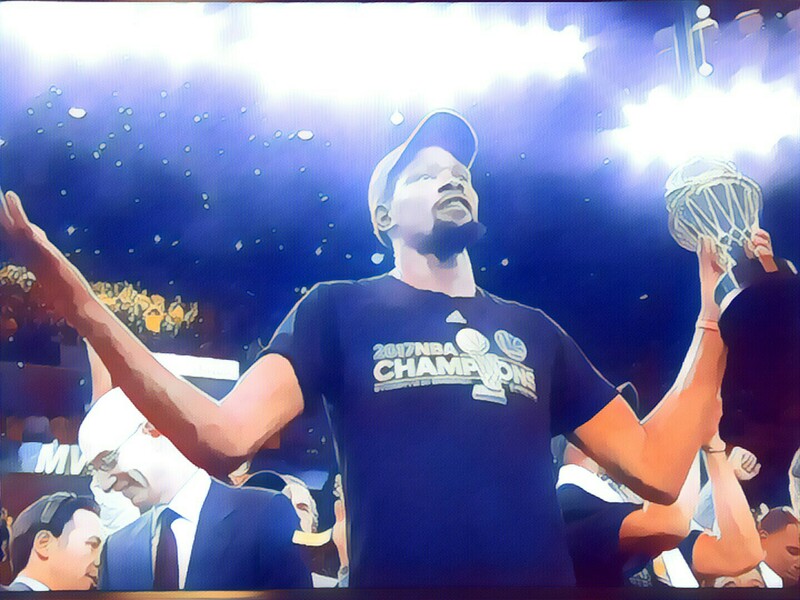 KD. Coming into the year, KD was hated for going to the team that ousted him. Now that he’s got the title and he will have a ring, let me break this down for you. If KD opted to stay in OKC, he would’ve had to deal with finding out who was the #1 option with Russell Westbrook. He would’ve been without Serge Ibaka who I though enabled them to take down the Warriors and Spurs. With that said, had he stayed in OKC, he would’ve still had to see both the Warriors and Spurs in the playoffs on the way to seeing LeBron in Cleveland. What would’ve been his odds? Be honest. NO ONE THINKS KD COULD’VE BEATEN LEBRON WITH OKC! That’s a fact. Doesn’t mean it couldn’t happen. He coasted most of the year, trying to fit in early and not be imposing. Steph, Klay Thompson, Dray, everybody took a backseat to making him feel comfortable. Steve Kerr did a good job in putting a roster together after losing so many pieces to obtain Kevin Durant. Got to tip our hats to the Golden State Warriors organization. They brought in a few journeymen in David West, Matt Barnes late, Zaza Pachulia (the Kawhi killer), and even Javale McGee. McGee had a hard time staying on any teams’ roster since he and George Karl were split apart. This is the best I’ve seen him play since then. There’s no other team that would gamble on him. It paid dividends, especially in the first 2 games of this final. No one is talking about how Andre Iguodala stepped up in KD’s absence either. We must, MUST, give this man respect for being willing to take a bench role for the better of the team overall. No one mentioned the Warriors depth as being a threat. Come on now. Livingston, Iggy, Barnes, West, McGhee? Throw Ian Clark and Patrick McCaw in there and you’ve got something that you can develop into something special indeed. I want to give LeBron and Kyrie their due respect for carrying their team this far. They put it all on the line. I personally think they should’ve obtained some different pieces and I can imagine that half of this roster will be completely different going into the 2017 season. Maybe Carmelo, maybe Paul George, maybe Chris Paul, Dwayne Wade, even DeMarcus Cousins could end up here. They’re all in the rumors. My sleeper here is Blake Griffin. LeBron and Kyrie were scoring at will but did tire out and their team, their bench, just couldn’t give them enough of a cushion. I think Bogut would’ve paid dividends and may have been enough for Cleveland to win this series. The Cavs aren’t as far away from being as talented as this Warriors team. Don’t forget that. Be humble with this Championship, Warriors fans. Congratulations on another great season. I’m sure we’ll see you here next year. Currently, the only threat out west is Kawhi Leonard. The basketball gods shined down on you!